Solutions: After careful consideration it was recommended to use ASGCO®’s NEW Semi-Ceramic Pulley lagging to correct the slippage and pre-mature wear. This lagging product features 40% ceramic coverage while addressing the customers concern of full ceramic on the belt, and while also providing a solution for the slippage that can tear at the back side of belt. The increased traction delivered by the ceramic is excellent in wet or outdoor environments. ASGCO®’s Semi-Ceramic Lagging was a win-win scenario for this customer. Results: After six (6) months of use there has been (zero) wear on the belt and (zero) wear on the lagging. 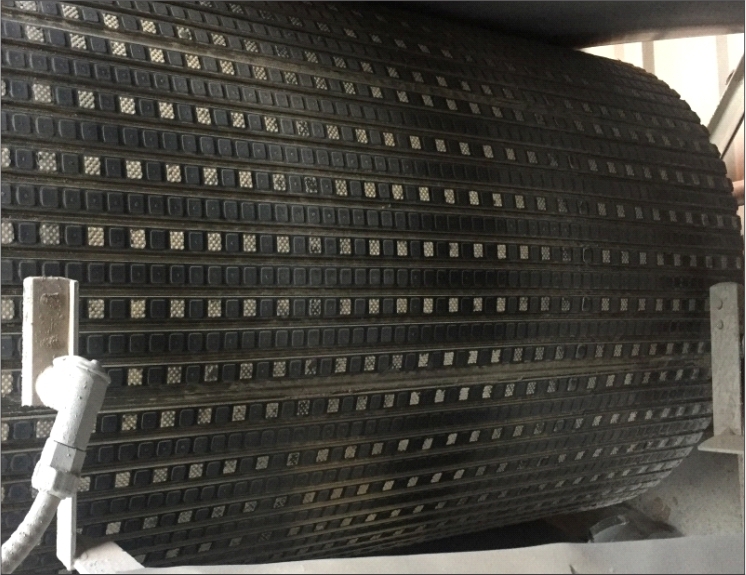 The condition of the belt looks the same as the day the lagged pulley was installed. It is important to note that ASGCO®s Semi-Ceramic Lagging strips are wider than competitor strips, so there are less seams and less points of entry for fugitive material to enter and break down. Another very satisfied customer with this new ASGCO® product!